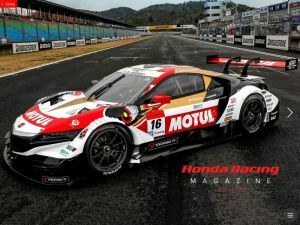 In this brand-new issue of Honda Racing Magazine we take a look at the Type R as it took on the Nurburgring, find out how F1’s Jenson Button got on when he tested his SuperGT machine and we have a chat with Tim Gajser’s mechanic Nico Nogé. Get behind the scenes with all this and more in Honda Racing Magazine, the interactive digital magazine that takes two and four-wheel racing fans inside the fast-moving and colourful world of Honda Racing. Packed with exclusive content, Honda Racing Magazine is perfect for any motorsport fan.